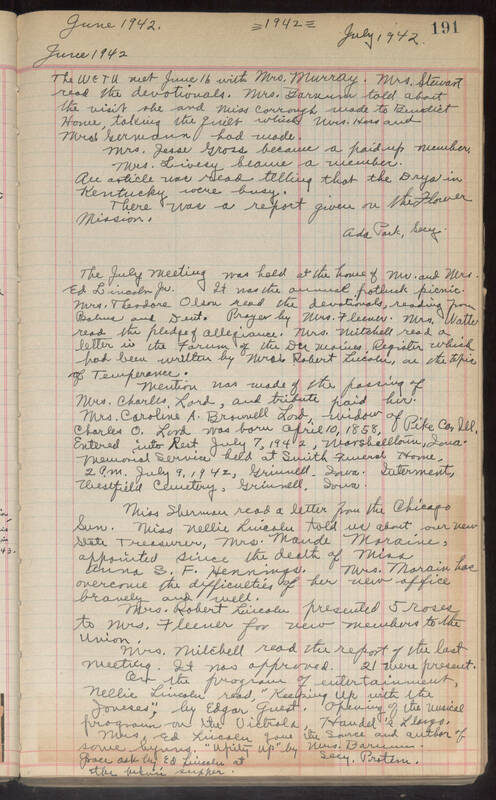 June 1942 =1942= June 1942 July 1942 The WCTU met June 16 with Mrs. Murray. Mrs. Stewart red the devotionals. Mrs. Barnum told about the visit she and Miss Carrough made to Benedict Home, taking the quilt which Mrs. Hers and Mrs. German had made. Mrs. Jesse Gross became a paid up member Mrs. Livesy became a member. An article was read telling that the Drys in Kentucky were busy. There was a report given on the Flower Mission. Ada Park, Secy. The July meeting was held at the home of Mr. and Mrs. Ed Lincoln Jr. it was the annual potluck picnic. Mrs. Theodore Olson red the devotionals, reading from Psalms and Deut. Prayer by Mrs. Fleener. Mrs. Watter read the pledge of allegiance. Mrs. Mitchell read a letter in the Forum of the Des Moines Register which had been written by Mrs. Robert Lincoln on the topic of Temperence. Mention was made of the passing of Mrs. Charles Lord, and tribute paid her. Mrs. Caroline A. Brownell Lord, widow of Charles O. Lord was born April 10, 1858, Pike Co. Ill. Entered into Rest July 7, 1942, Marshalltown, Iowa. Memorial service held at Smith Funeral Home, 2 PM, July 9, 1942, Grinnell, Iowa. Interment, Westfield Cemetery, Grinnell, Iowa. Miss Sherman read a letter from the Chicago Sun. Miss Nellie Lincoln told us about our new State Treasurer, Mrs. Maude Moraine, appointed since the death of Miss Anna S. F. Hennings. Mrs. Morain has overcome the difficulties of her new office bravely and well. Mrs. Robert Lincoln presented 5 roses to Mrs. Fleener for new members to the Union. Mrs. Mitchell read the reports of the last meeting. [?] now approved. 21 were present. On the program of entertainment, Nellie Lincolne read, "Keeping Up with the Joneses," by Edgar Guest. Opening of the musical program on the Victrola, Handel's Llargo, . Mrs. Ed Lincoln gave the Source and author of some hymns. "Upity Up" by Mrs. Barnum. Grace ask by Ed Lincoln at the [?] supper. Secy. Protem.